If you're new to What It's Like on the Inside, thank you for joining me here. It's a space that I've used to chronicle my last seven years as an educator at the classroom, district, and state levels. Some of the content is science-related. Part of it is specific to teaching. There are rants and raves sprinkled about. I talk about being an EdTech skeptic while (currently) working in EdTech. 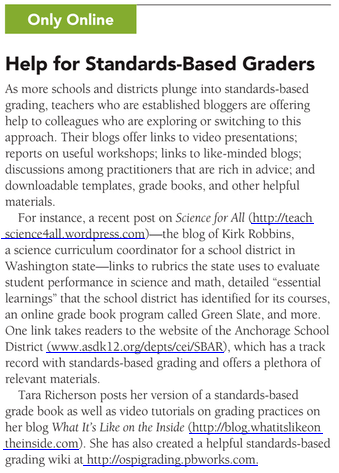 And yes, there are a lot of posts on grading and assessment to explore. I also blog at Excel for Educators, which has a lot of nifty posts and tutorials on building and using gradebooks for standards-based grading. If you can't find something you like here, check out some of my suggestions on my blogroll. You're most welcome to hang out and learn, reflect, and join the conversation. If you need a doggy bag, click the RSS button at the bottom of the sidebar and posts will be delivered to your virtual doorstep (I'm also on Twitter). Let me know if there's anything I can do to make your stay more comfortable. I'm happy you're here! I'll be looking for an article under your byline in the future.